A released photo of Chung Lai Mei, one of those arrested during the 1987 Marxist Conspiracy, showed her in a militant training camp in India in July 1986. The camp belonged to the Tamil Eelam Liberation Organisation (TELO), an armed insurgency group that was fighting was an independent Tamil Eelam in Sri Lanka before it was decimated by its more famous cousin LTTE or Tamil Tigers. TELO still functions as a political party today. 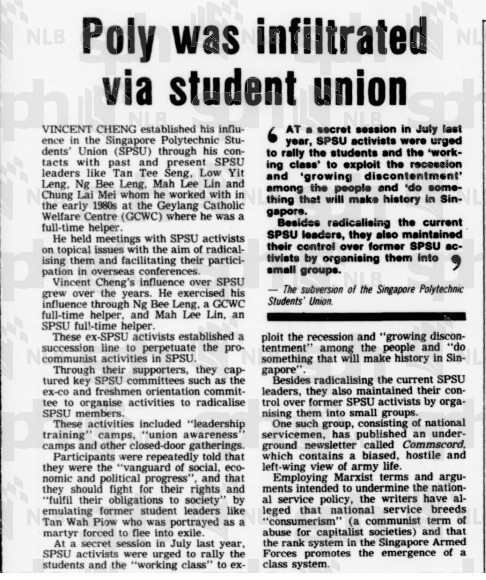 Chung, who dropped out of Singapore Polytechnic, was active in the Singapore Polytechnic Students' Union (SPSU) during 1981-1985. SPSU was charged by the government to be infiltrated by Marxists led by Vincent Cheng. Chung later became the deputy secretary-general of the Asian Students' Association (ASA), a Hong Kong-based alliance of militant students in the region. In 1985, Chung supposedly led polytechnic students to demonstrate outside the Sri Lanka High Commission in Singapore demanding for the release of political prisoners in Sri Lanka, a country plagued by sectarian violence along ethnic lines. SPSU was allegedly radicalised under the leadership of Vincent Cheng who build his contacts with the SPSU leadership through Geylang Catholic Welfare Centre (GCWC). As a full time helper in GCWC in the early 1980s, he got to know SPSU leaders such as Tan Tee Seng, Low Yit Leng, Ng Bee Leng and Mah Lee Lin (all detained under the 1987 Marxists arrests). Cheng exerted influence over SPSU through Ng and Mah and managed to control the executive committee and freshmen orientation committee. 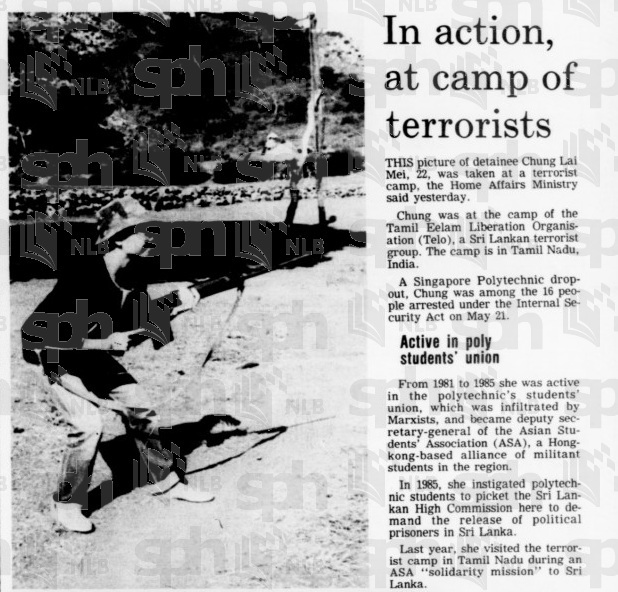 SPSU activities included leadership training camps and closed-door gatherings where participants were told to fight for their rights and emulate Tan Wah Piow who was a martyr forced to flee Singapore. There was also a secret session where SPSU activists were urged to rally the students and working classes to exploit the on-going economic recession. However, one can argue that these were merely more radical students and that these were gatherings in their capacity as private individuals and like-minded friends. On the other hand, others could also argue that these are akin to pre-nascent Islamic Jihadist terrorists and radicals gathering to indoctrinate fellow aficionados or recruiting new converts. A matter of perception that both sides, government and detainees, are more than willing to wring to their advantage. An interesting observation was that former SPSU activists started an underground newsletter called Commscord which took a leftist interpretation of army life. It used Marxist thought to allege that national service breeds 'consumerism' and that the rank system of the SAF promotes the emergence of a class system. It is essential that the PAP government seriously consider releasing more information and materials to let Singaporeans judge for themselves the events and circumstances of 1987. Until now, what is presented of the Marxist arrests is a stark dichotomy between government allegations and detainees' pronouncements of innocent. While such a release may jeopardise operation techniques and betray ISD sources, government may consider a partial release or obfuscating details so as to protect those individuals.